When working with MadeByPi, the Little Black Book and first direct – the unexpected bank – sponsored the Observer Food Monthly Awards and wanted a website banner to encourage customers to vote for their favourite food, drink and eateries. 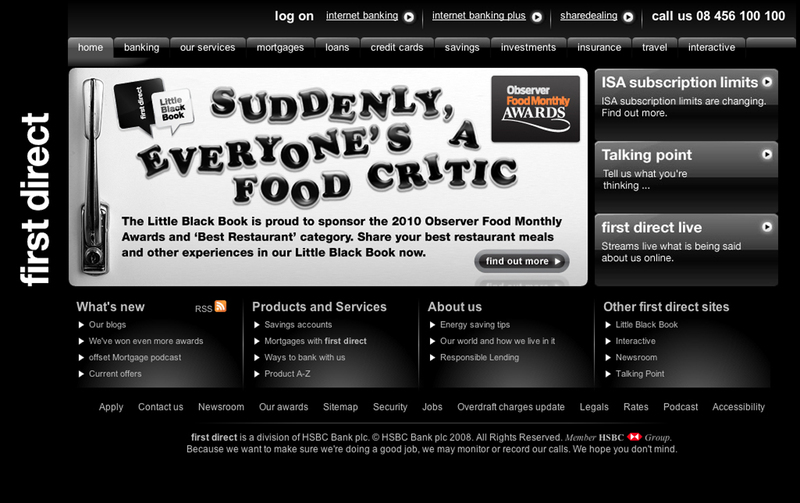 Little Black Book and first direct are Sponsors of the 2010 Observer Food Monthly Awards and are also sponsiring the ‘Best Restaurant” category. We think as a first direct customer, you can bring plenty to the table. You’re very particular about where you bank, so you’re likely to be equally discerning about where you eat and drink. You could win a delicious foodie prize fit for a critic. We’d like you to be a food critic by simply voting for your favourite foodie things. In return, you could find yourself packing away one of the following prizes from the Observer Food Monthly Awards.